A Yeti detective done in a crime noir style comic book. Yeah, you read that right, a detective that is a yeti. The artist on the series Sean Morgan was the second person I talked to at the San Fransisco Comic Con, in fact you can hear me do a little mini interview with him on this episode. Sean was a fun person to talk with, I went back to his booth a few times to just say hi and see how the show was going for him and Doc Yeti. Now that I’m back and have had time to re-enter society after all the traveling I’ve done I sat down to read Doc Yeti, and I have some thoughts. First, what is Doc Yeti? It’s a webcomic that started back in 2016 on a dark and stormy night in October. I’m only assuming this as it makes the creation sound more ominous. I’m also only assuming this because that is the date on their first page on the website, even though in the comic it says “copyright 2016”. Sean did warn me be was giving me a copy that did have a few typos in it, I think that may be one of them. So let’s just go with it, it was a dark and stormy night in October of 2016 that Doc Yeti was birthed onto the internet, and we have not been the same since. Or we have, I’m not sure, it just sounds better to start it out that way. Fine! I will! I see you don’t appreciate my attempt at creating a little atmosphere for the review. Hold on a second while I got read the book so I can give you a review like you are demand. Wait here, be back in a matter of your eyes moving down to the next line. Ok, I’m back. Did you miss me? I know I was gone for so long, but we can move on to the review of Issue 1. With that said, spoilers past this point! The book opens with a classic pun right out the gate so you know what kind of book you are getting yourself into. I really appreciate that it doesn’t waste anytime setting up what to expect. That being said, the book is not full of puns and insanity, quite the opposite. 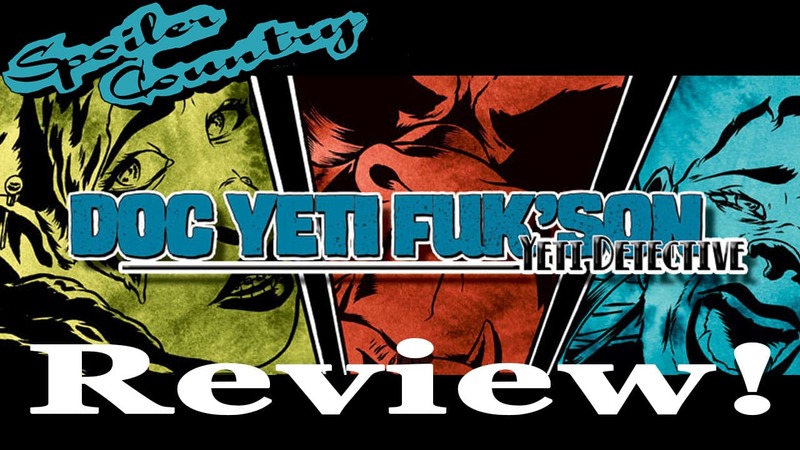 It weaves a tale of a murder most foul while building up a back story for Doc Yeti that evolves as you read the first issue. I found my self intrigued by the characters, Alison does a great job of giving you information as it’s needed and let’s the story unfold as it goes. She doesn’t expect you to already know what’s going on nor does she treat you like an idiot with the story and assume you can figure things out. Half the fun of reading new stories is decipher what is being told and piecing everything together. This book does just that, it tells you a story and when it ends you want to continue and read more. Let’s talk about Sean Morgans artwork. It’s apparent Sean is an illustrator and likes to set a scene. I’ll be honest, I wasn’t too big of a fan of the amount of screens he used on the first few pages as I felt they took away a little from the page. After the first few pages with this, which as I think about it I believe he did to set the tone of “this is in the past” you see the artwork evolve to tell the story. He does a really great job at moving the characters along in this human/yeti world and conveying their emotions. I like the way he lays out his panels. One thing I’ve talked about on the podcast before, especially on our review of Stephan Franck’s Silver, a book that is in black and white is difficult because it has to be drawn differently than a book in color. In color you can build things out in layers that are easily distinguished by the human eye (not sure how it works on the yeti eye) so it makes moving a long the pages easier. In black and white you have to be careful your backgrounds are not overly complex, or if they are they don’t distract the reader from the flow of the story. It’s very easy for a black and white comic book to become almost unreadable when the artwork is so busy and nothing is telling your eye where to go. Sean doesn’t seem to have this issue. I wasn’t lost while reading this comic, I was intrigued about what was in each panel and followed the flow of the story with ease. I do think this story would look great in color as well, and would probably add a lot. All in all I think Doc Yeti is a fun read, the mystery blends with the humor very well. You can read this for yourself on their website at docyeti.com, which I suggest you do.